It was a really good cry. The kind of cry where the tears were big and bold, rolling slowly down my face. I didn’t wipe them away. I felt them and allowed them to flow. It was a release that needed to happen. You see, at times, I feel like giving up. 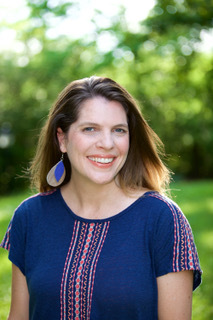 Giving up on my dreams to connect and inspire and teach and learn from all the amazing women I get to share courses and build community with online. I feel like giving up not because it isn’t fulfilling – oh no, it’s incredibly enriching and is something I so deeply love. I wonder…how can I continue to build an online community and teach creative courses that are inspiring, enriching, and support women on their journey of personal growth and transformation? Am I out of my mind for thinking I can really do all this??? I’m tired of wearing so many hats. Being a solopreneur is hard. I am the course creator, the graphic designer, the videographer, the marketer, the bookkeeper, the writer, the idea generator, the troubleshooter, the teacher, the customer service rep and add that to the long list of responsibilities that come from taking care of my A Free Spirit Life family / team pictured above. Well yes, I could classify myself as crazy if I think I really can do it all…ALONE. So rather than take on the world, I do what I can. Rather than think I have to have the perfect blog, the perfect videos or the perfect marketing plan, I do what I can. I let the tears roll when I’ve had enough. I ask for help. I rest. And I try again. I tell you this not to complain. But rather, because I know we all have struggles. If I’m struggling, I know I’m not alone. You may not have the same struggles, but you’re human, too. Acceptance is a big part of the practice in living a mindful and free spirit life. Accepting where we are in this moment and celebrating the stage of life we are in and the choices we’ve made to this point, is a practice in loving-kindness and grace. My invitation to you is this: Connect deeply with your true feelings. Give yourself grace this week. Allow the struggle to be there. Relax and ease into it. Let the tears flow and then, my friend, let it go. Are you trying to “keep things together” and feel like if you stop, everything will fall apart? Are you holding on to the way things used to be? Are you feeling resistant to change? Are you living your life based on what you wish it would be or think it should be, instead of where you are in this moment? Do you need to ask for help? What would happen if you could let all of that go and be open to a new way of being? Relax and release what you’re holding on to. It’s time to celebrate what IS. It’s time to OPEN YOUR HEART to new beginnings. I am wildly passionate about connecting, supporting and empowering women – just like you – on their journey of living more authentic, creative lives. 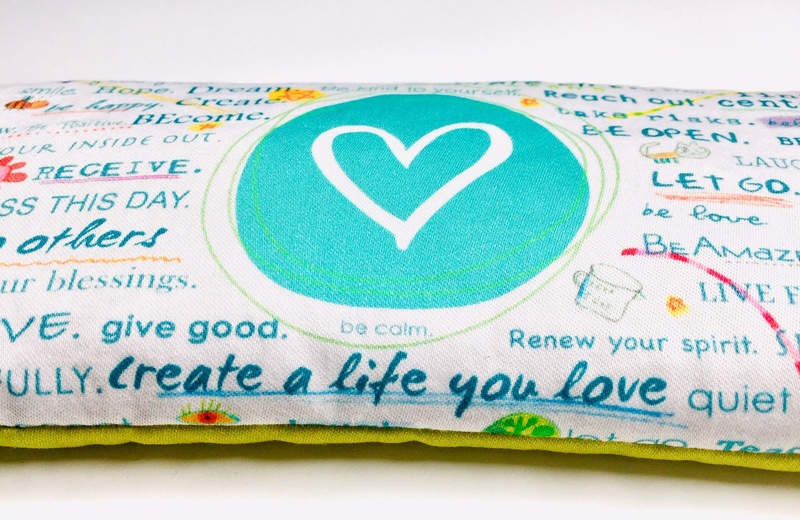 I am deeply excited about inspiring women as they awaken to the wisdom of their own hearts. 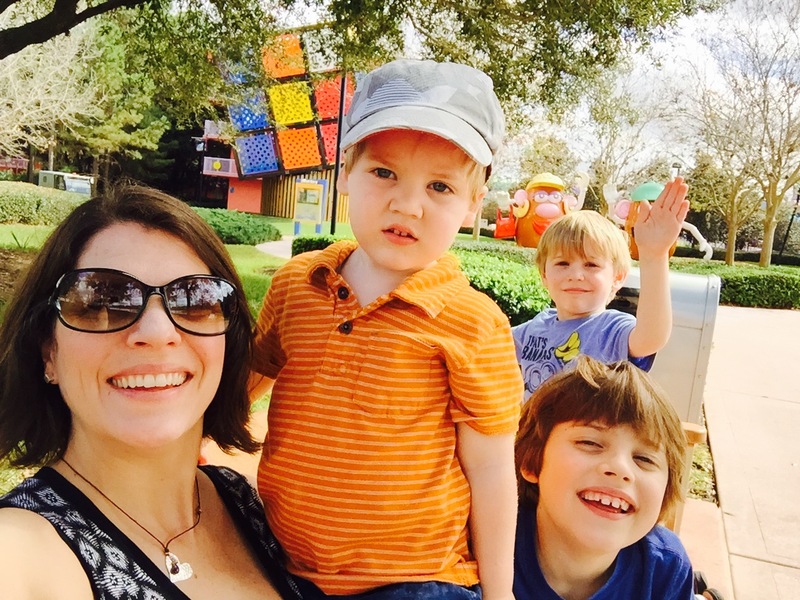 I know that art, yoga, creativity, healing and wellness are a big part of my path, just as raising these sweet little souls are. So, no, I won’t be giving up. Sometimes when we feel like we want to give up it simply means something has to change. Maybe that something is letting go of the preconceived idea of what we think our life should look like, and instead simply honor, embrace and accept how it is naturally unfolding. Pause and rest when you need to. Ask for help when you need to. Cry and stumble and celebrate along the way. It won’t be perfect, but it will be just as it needs to be. Let’s continue to celebrate this imperfect and beautiful life! 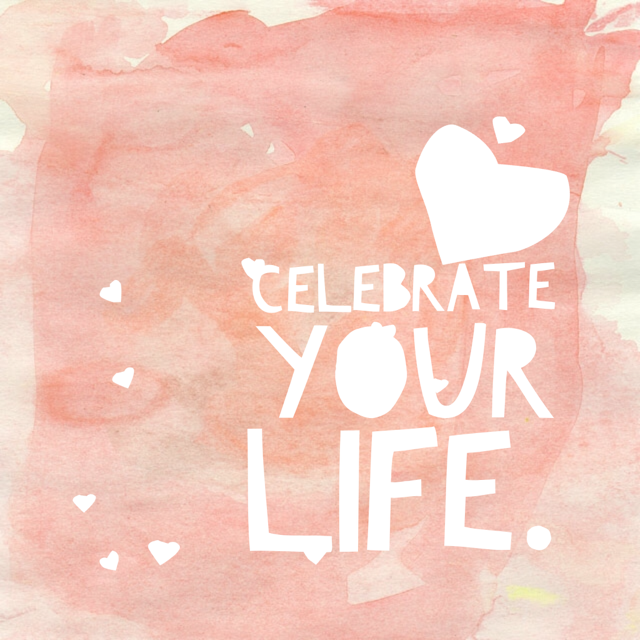 Life is a celebration. Celebrate your life today. 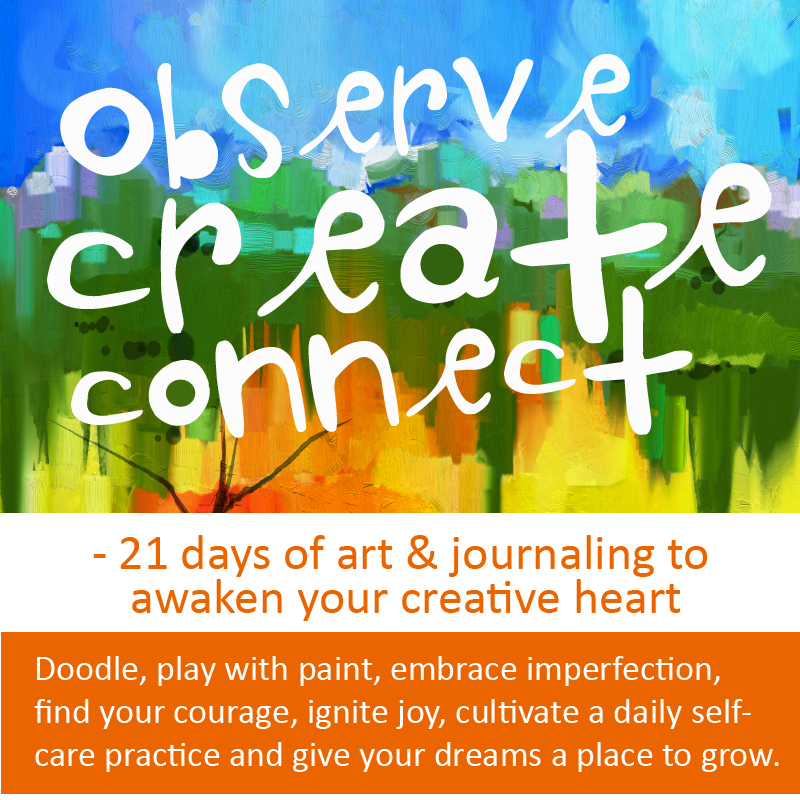 Observe Create Connect – 21 days of art & journaling to awaken your creative heart starts THIS Monday! You can learn about the course by clicking HERE. 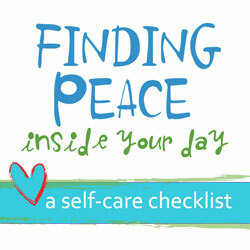 This course will lead you through a simple and powerful daily practice that will help you move from overwhelm to joyful living. This journey will help you face your fears so you can walk more confidently in your life, so you can express your true voice and creativity, and so that you can shed self-doubt, embrace the mess that comes from creating and from the natural chaos of life, all while celebrating the new beginnings taking place. Help me spread the word about this class and send the link below to anyone you think would be interested. We need each other – free spirits unite!